It’s started to get chilly in the mornings here in Philadelphia. It warms up as the day goes on, yet there’s still a sense of fall in the air. One morning, without warning, it will be cold. And even though I only have a short walk to the shop, I hate to be cold. In preparation for that day, I knit the Montana Scarf. Made from Tahki Montana yarn, a beautiful bulky 100% unprocessed wool roving, the Montana Scarf is a whopping 7 inches wide by 84 inches long. In the event of extreme cold, you could wrap it around your nose and mouth – even over your head, if you wanted. And while it’s large and warm, it’s light and comfortable. Here’s the pattern for the Montana Scarf. Row 1 (right side) – *K3, p3; repeat from * to end. Row 2 – *K1, p1; repeat from * to end. CO 30 stitches. Begin stitch pattern with Row 1. Repeat until work reaches 84 inches. For now, the scarf is on display in the shop. I hope it’s a while before I need it! Bobby, I think the Montana Scarf is a good scarf for beginners. If you haven’t already started, I might begin with something that’s the same on both sides. For example, cast on an even number of stitches and k2, p2 (knit two, purl two) across each row. Have fun! I like the pattern but need a scarf that is not as warm and not as thick. Can you recommend a yarn to use. You can knit the Montana Scarf with any thinner yarn and corresponding needle, and it’ll still look great. If you use a DK weight or thinner, I’d add more stitches – the pattern’s a multiple of 6, if memory serves – so that it’s not too skinny. Glad you like the pattern. Thanks! love this scarf! Knitting two for gifts this year. I’ll post a pic on my blog and fb page later today. Thanks! Somewhere along the way, quite far in, I must have repeated a row, but I can’t find the mistake anywhere! Is this a pattern that would hide it well? This is a great pattern! I will start it soon! Thanks so much!! Does this stitch pattern have a name? 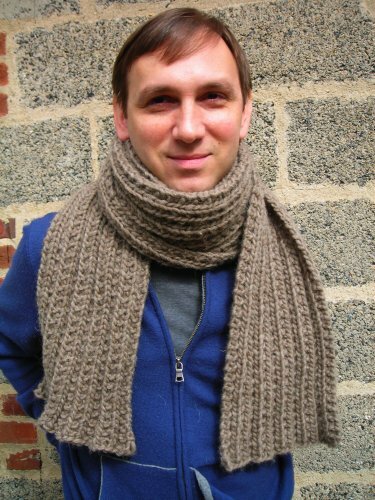 This is really a neat scarf and thanks for sharing the pattern. I am a real beginner, looking for an attractive pattern for a blanket. Do you think this would work for a blanket? Could it be done in a cotton? If not, could you suggest another pattern? Myra, this would make a wonderful blanket in cotton. The pattern has a 6 stitch repeat, so just add multiples of 6 to get the width you’d like. Have fun! I wonder…. would it looks good if I use demet wool (30% wool 70% acrylic) n 3,25mm needle? I’m looking forward to ur reply. Love love love this scarf. I made 3 last year for Christmas gifts and am starting another today (my son lost his, but it’s nice to know someone else’s neck is being warmed-LOL). He specifically asked for the same scarf and my boyfriend says its the warmest scarf he’s ever had. Thanks for sharing!!!! Thanks for sharing this great pattern. So easy and looks great !!! Made one for a Christmas gift and liked it so much that I am now making one for myself 🙂 !!! Thanks for this scarf pattern! I’m knitting one for my cousin and one for my roommate. I was wondering, though, do you have a good suggestion for doing a type of chained edge on it? I never thought of using a chain stitch with it. I found this description of three variations you can experiment with – http://www.knitsimplemag.com/node/81 (in the bottom half of the page) – which might give you the look you’re picturing. Have fun! Looks very nice, and really easy to follow the pattern. I’ll start right away and knit it for my one of my grandsons – I’m sure he’ll love it too. Tks for the pattern. Beautiful pattern for a beginner…. It’s wonderful pattern and very easy to work on. I am just going to start now for my hubby. I am just a beginner and it’s going to be my second scarf. Thanks a lot for sharing this pattern. You’re very welcome! I’m glad you like it. 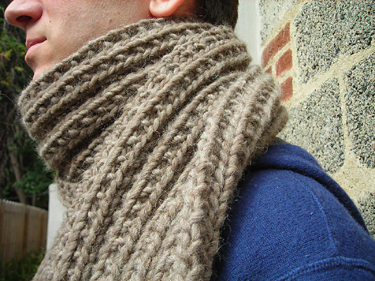 Thinking of making this but turning it into a chunky cowl using a provisional cast on. Nice quick and easy pattern. Thanks so much for sharing! This is a great pattern. I’ve made it a couple times; once with a chunky yarn and once with a thinner yarn and both turned out awesome! I can’t thank you enough for this pattern. Over the last 3 yrs it has been my go-to design for my kids, grandkids and in-laws. I never get tired of working this pattern. It’s easy and complements any type of yarn. Here in Wisconsin, we appreciate warm designs and warm yarn!